Sometimes you can score a real deal on certain cuts of meat. Unfortunately, these cheap cuts are often tough, but that's nothing a little tenderizing can't fix. If you use a tenderizer, you can make a tasty dish and know you've saved money in the bargain. Here's how to make a cheap and easy meat tenderizer. Just add a tablespoon or two of white vinegar to your cooking liquids and your roasts, stew meats, and steaks will come out tender and juicy every time. Another option is to pierce your meat all over with a fork and then soak it in vinegar for an hour or two before you cook it. Whichever method you choose, be sure to cook your meat in a non-reactive pan or dish. Cast iron and some other metals can react unfavorably with the acid in tenderizer. Coated non-stick pans or glass baking dishes are ideal. The acetic acid in the vinegar breaks down meat fibers, making them more tender and flavorful. If you don't have any white vinegar on hand or would prefer to use something else, you can also use wine, citrus juice (lemon, lime, orange), tomato sauce, beer, pineapple juice, soda, coffee, tea, buttermilk, yogurt, or any other type of vinegar (apple, balsamic, red wine, white wine). The acid in these foods will tenderize the meat just like white vinegar. So choose a tenderizer with a flavor that appeals to you and complements the dish that you're making. 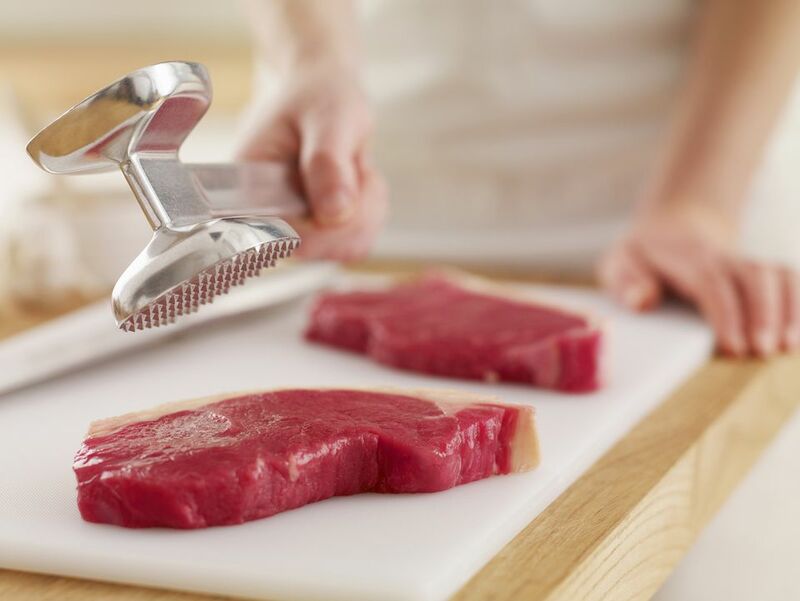 Use a Meat Mallet: You can pound the meat with a mallet to tenderize it before cooking. This has the added benefit of flattening the meat out so that it cooks faster. If you don't have an actual meat mallet among your kitchen equipment, you can use something heavy like a cast iron pan or a rolling pin instead. Just be sure to sanitize whatever you use afterward. Cook the Meat in a Crockpot, Pressure Cooker or Roasting Pan: Cooking meat for a long time is a great way to make it fall-apart tender, but you have to use a cooking method that locks in moisture, or your meat will come out dry. That makes crockpots, pressure cookers, and lidded roasting pans ideal for cooking tough cuts to perfection. And since they're all relatively hands-off cooking methods, they're perfect for busy days. Marinade: If you're trying to avoid using a flavored meat tenderizer because you plan to flavor the meat later, using a marinade offers the best of both worlds. Marinades typically contain an acid to tenderize the meat (likely one of the tenderizers covered above), along with other ingredients to enhance flavor. You can buy ready-made marinades, but they're really easy to make yourself.